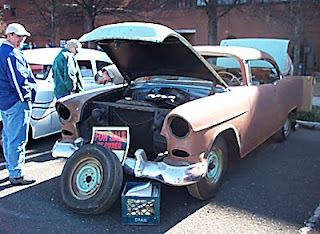 1954 Pontiac - runs good, $3200. For sale in 2009 Fairgrounds car corral. 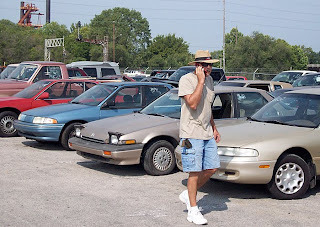 Old car auction, swap meet forced out from landmark racetrack site. 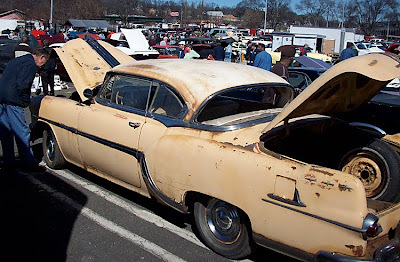 Bill Chapman's Alabama Antique & Classic Car Auction, Car Corral & Swap Meet is moving from the Alabama State Fairgrounds in Birmingham to Talladega Superspeedway's infield. Chapman's annual automotive event is Alabama’s version of Barrett-Jackson’s mega buck auction seen on SpeedTV. It has grown every year since 1980 when Chapman started it. "We had outgrown the Fairgrounds but had not planned to move," Chapman said. For the past 28 years the event has been held at what was the home of the oldest race track in Alabama. Circumstances forced Chapman to move the event 52 miles away to the notorious infield of NASCAR's Talladega Superspeedway the weekend of February 26-28, 2010. "Last year's event almost didn't take place. Buildings that we were supposed to have access to at the Fairgrounds were being torn down the week of the show," Chapman said. "The city of Birmingham destroyed a source of revenue." Former Birmingham Mayor Larry Langford, convicted of 60 bribery-related counts on Oct. 28, 2009, spearheaded a plan that proposed to build an Olympic-style village in the place of the historic 5/8th-mile race track known as BIR or Birmingham International Raceway. The race track, grandstands, along with most of the buildings, excluding the Bill Harris Arena, were demolished last year. I wrote about Chapman's final antique auction at the Fairgrounds, (here and here). Chapman says the Talladega car auction/corral and swap meet will be a full 3-day event. Spectators will enter through a gate near turn 3 and drive across the backstretch of the track into the infield. If you attend the show be sure to check out the cars in the parking lot too. At past shows I have seen a large number of spectator's classic cars in the parking lot with for sale signs propped in their windows. More than 400 cars are expected in the car corral. That's where you can sell your own car from an assigned spot. Cost is $100 per car. Saturday at 11 a.m. the car auction takes place inside the Sprint Cup Garage. "This will allow a travel day for those from out of town." Chapman also said he "expects this to be the largest show he has ever had." Last year more than 100 cars went through the auction. This should be a good time to find a deal on a classic vehicle or that hard to find part you need. 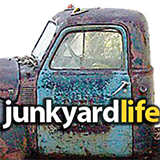 That is, if junkyardlifers have cash to spare? Also, the Dixie Vintage Automobile Club is also hosting a car show on pit road during the 3-day event. Friday, February 26 8 a.m. - 6 p.m.
Sunday, February 28 8 a.m. - 11 a.m.
For more info contact Bill Chapman 205-426-5256 or email here. 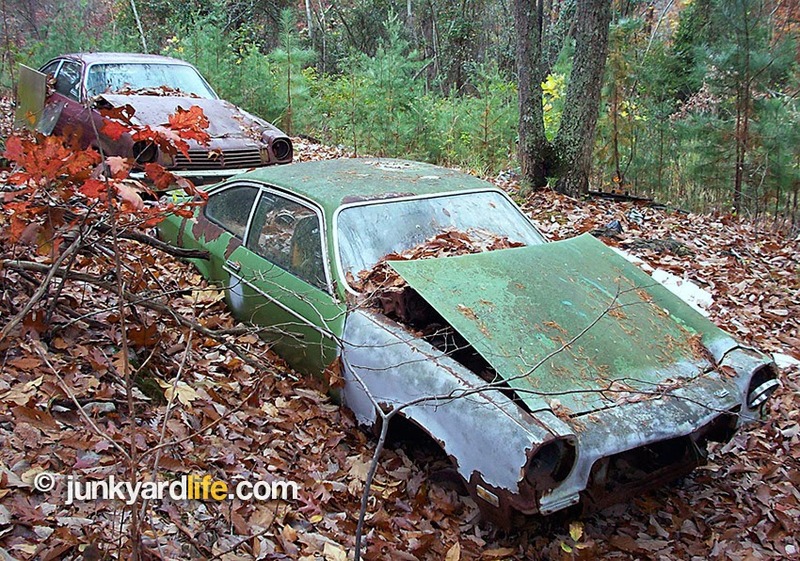 Send your car stories and photos to junkyardlife. 1955 Chevrolet hardtop - complete, $8,950. For sale at 2009 Fairgrounds car corral. 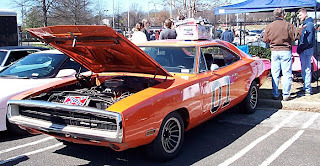 “General Lee’ clone 1970 Dodge Charger 500 for sale at 2009 Fairgrounds car corral. 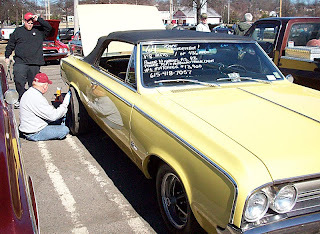 1964 Oldsmobile 442 convertible for sale for $13,900 at 2009 Fairgrounds car corral. 1961 Chevrolet Impala ‘bubbletop’ for sale for $24,500 at 2009 Fairgrounds car corral. 1953 Chevrolet ambulance for sale at 2009 Fairgrounds car corral. Want to drive home in a new $400 car? 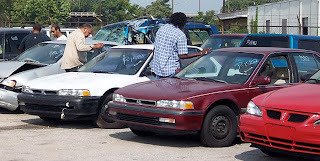 Take a trip to a local auto auction and beat the recession blues. Deals are ready to be had on ‘new’-to-you cars. Keep in mind these deals might have some dents, fire damage or be inoperable. That means the savings are passed on to you. No monthly payments to worry about or high-pressure from a salesperson. Win the bidding, pay up and drive or tow your prize home. I checked out the auction action at Weil Wrecker in Birmingham, Alabama recently. 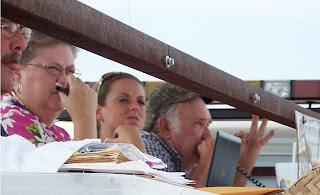 Steve Weil, the owner of Weil Wrecker, his wife, Sharon, and daughter, Stacey Kaylor, were signing bidders in and giving them bid numbers when I arrived shortly before 10 a.m. on a Wednesday. Two dozen bidders were canvasing the giant surface lot, inspecting possible purchases. 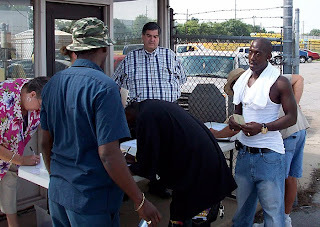 Shortly after 10 a.m. bidding started on three vehicles seized by the U.S. Marshals. To bid on these vehicles a deposit of $500 was required. That covers storage fees, should you win the bid and be unable to pay. Auctioneer Drexel Johnson was seated on a flatbed wrecker with a metal awning. A long table and chairs lined the makeshift stage. An orange traffic cone was placed on each vehicle as it went up for bid. This is a precaution to prevent people from bidding on the wrong vehicle. Drexel entertained as he worked the crowd for the highest bids. Some bidders in the crowd were first-timers, Tyrone Colburn is a regular at Weil’s auctions. 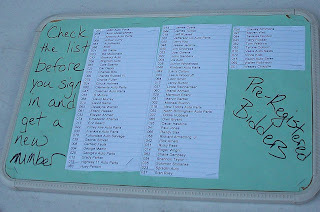 He has his own bid number automatically on the bid sheet at each auction. He usually buys wreck vehicles to rebuild. Once he bought a 1997 station wagon for $200. He took a test drive around the auction lot to make sure it was roadworthy, then drove it home. Adamsville's Bill McDonald enjoys auctions despite buying a vehicle which he learned had a 2-inch hole in the engine block. He discovered the busted engine block when he got the car home. “I buy cars for my son to fix,’ said McDonald. 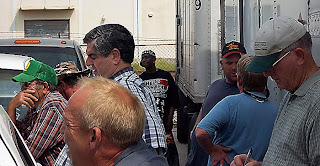 I noticed several familiar faces that were at a recent ABC Towing auction in Trussville. 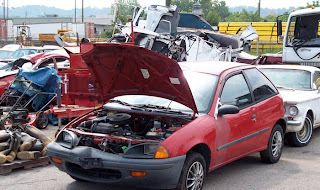 Gordon Madden, an auction regular, is a salvage/scrap buyer. 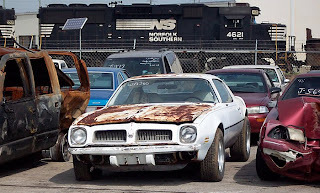 He placed a $425 bid on each of the cars on the abandoned vehicle lot. By doing so, all the bidding started at a minimum of $425. 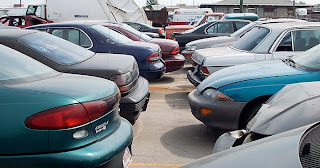 There were 160 cars on the abandoned vehicle lot. That takes some guts and money. Gordon says business is soft right now. He worked the lot like a seasoned auction pro. 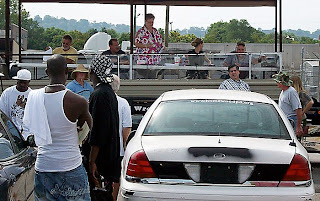 Positioning himself between the auctioneer and the vehicle being auctioned. Madden was confident and bid without hesitation or fear of making a mistake. WHAT IF I WIN THE BID? If you are the lucky bidder, be prepared to pay immediately following the auction by cash, check, credit card or cashier's check. Sales tax will apply on vehicles without a title. If you want title paperwork, it costs an extra $35. Weil says vehicles must be removed within a week. WHEN IS THE NEXT AUCTION AT WEIL in 2010? On the third Wednesday of each month at 10 a.m. Weil advertises the auctions in The Birmingham News' legals classified section, The Alabama Messenger newspaper and online. A total of 222 vehicles were sold at the Weil auction I atteded. Prior to the sale a gentleman was escorted out of the gated lot by security. He was caught him stealing items from the cars. You can look, but be advised, do not remove anything from the vehicles like this guy did. The police showed up, ran his name and arrested him for outstanding warrants. How many good deals did he miss out on? Do you have a cool vehicle or story? Send your story and photos here. An early 60s Corvair ready for auction. Bidders register prior to auction. Bidders gather near the auctioneer’s mobile trailer. Dozens of small economy cars were up for auction. 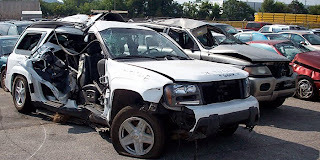 Many of the vehicles were wrecked or damaged. 1979 Camaro lowrider at auction. 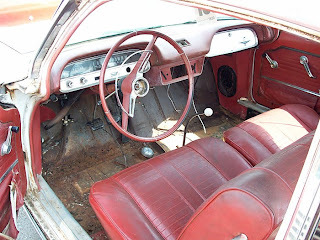 Interior of Corvair at Weil’s auction. The Vega sure looked like a winner. "Chevy's New Little Car" was the brainchild of one of the most successful executives in the automobile industry. It had an advanced overhead-cam engine employing the latest in cutting-edge materials science. It was built in the most highly automated assembly plant in the Western hemisphere, at a breathtaking pace of more than 100 cars per hour. The reviews in the buff books were uniformly positive, if not downright glowing. Road Test called it "innovative." Car and Driver said it "provides an excellent combination of performance and economy," proclaiming it "one of the finest-looking compact sedans in the world," and "a car for all occasions." 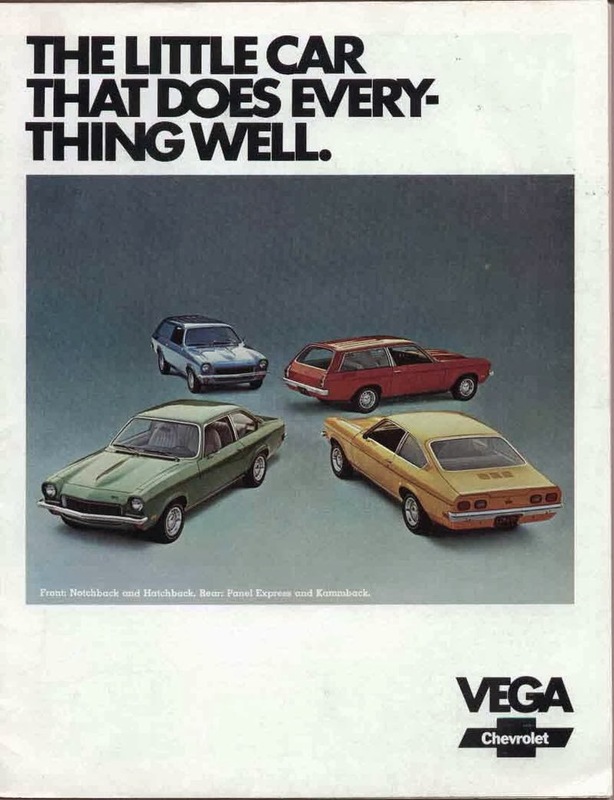 Road & Track was no less impressed, declaring the Vega to be "the best handling passenger car ever built in America." Mechanics Illustrated agreed, describing the handling as "excellent, quick, and sure." Motor Trend called the stripped-down base model "a magnificent automobile in its own right without any options at all" (!) 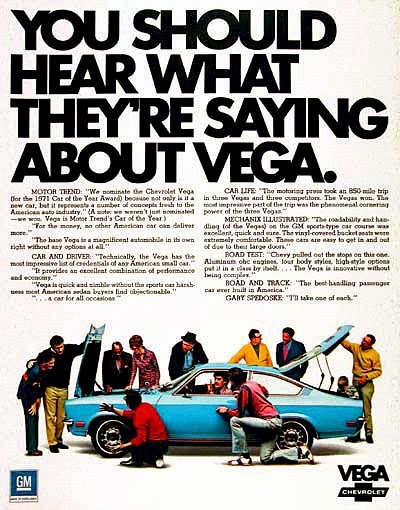 and named the Vega its "Car of the Year" for 1971 and 1973. The public seemed to agree. The Vega was one of the best-selling cars in America for most of its production run, with a total of nearly two million units out the door over seven model years. If you also count the badge-engineered Pontac Astre and the Monza/Sunbird/Starfire/Skyhawk quartet that shared the same platform, the grand total is probably well over three million. 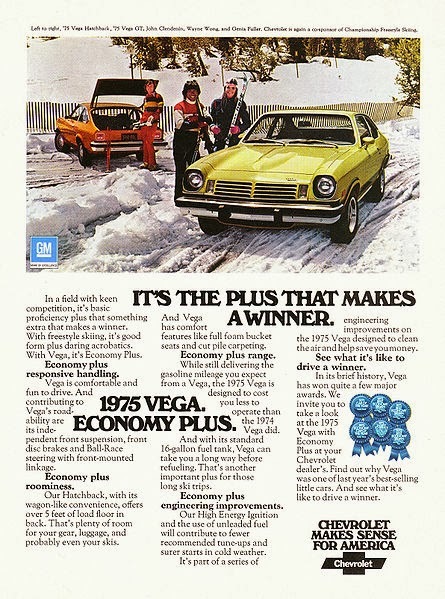 So why, then, is the Chevrolet Vega remembered today as a colossal, unmitigated disaster? As the people who analyze events like bridge collapses and ferry sinkings and airplane crashes will tell you, a major catastrophe is most often made up of minor failures and mistakes and miscalculations, and maybe even a few instances of plain old dumb bad luck. When several otherwise-small problems occur closely together, combining and synergizing and reinforcing each other, you can quickly end up with something spectacular, ruinous, and expensive--what the kids today call an "epic fail." In one sense, that's what happened with the Vega. A lot of relatively minor mistakes and failures added up, turning a promising design with a lot of good qualities into a car that regularly appears on nearly everyone's "10 worst" list. As for why this was allowed to occur, it's a long story. Let's start with a bit of history. In the mid-1960s, General Motors was at the height of its glory. Except for AMC, the smaller "independents" had been run out of the auto business by the General's immense financial strength and economies of scale, which allowed it to price its cars at a level smaller competitors couldn't match. The other two of the Big Three, Ford and Chrysler, weren't going away, but they were no existential threat, either. GM owned about a 50% share of the domestic automobile market, and the only thing holding it back from grabbing even more was the worry, among certain senior executives, that if GM had "too much" market share, the government would file an antitrust action! While GM bestrode the Earth like a colossus, pesky little imports were nipping at its ankles. GM had countered the first wave of imported compacts in the early '60s with the Corvair, and then the Chevy II and its derivatives. The downsized Detroit iron introduced by the Big Three in the early '60s had held the line against the "furriners" and knocked compact-car oriented Rambler down a peg or two, but they hadn't completely cleared the field. VW was still in the game, gaining market share each year, and now the Japanese were moving in. At first, GM executives belittled the threat. Compacts were a niche market, not big enough to be worried about, and foreign cars were for wierdos. Beetles were comic characters in Disney movies. As for the Japanese, ha! Don't make us laugh! Those tiny cars with their Bride-of-Godzilla styling, they'd never make it big in the Land of the Free and the Home of the Long Wheelbase V-8 Land Yacht. The GM executives who disparaged buyers of those little foreign cars as oddballs and outliers soon discovered that denial isn't an effective coping strategy. Sales of compacts and sub-compacts grew every year, capturing over a quarter of the U.S. market by 1969--and half of those little fellas were imports. GM realized it was going to have to meet the imports head on and build its own subcompact. Of course, this was the mighty General Motors, one of the most powerful industrial corporations on the planet, employing legions of highly talented engineers to design the thing, so there was little doubt that the battle would be over as soon as it started. One of those highly talented GM engineers, Edward N. Cole, had ascended through the ranks to become the president and chief operating officer of General Motors. At his direction, the corporate engineering and design staff began work in 1968 on a project code-named XP-887, a new subcompact that would be sold as a Chevrolet. As you've probably already figured out, the XP-887 project is what ultimately became the Vega. Traditionally, GM's divisions had done most of their own product planning, development, design, and engineering. The divisions shared platforms and components (like transmissions and axles and such) and even body shells, but for the most part Chevy people designed the Chevys and Buick people designed the Buicks and so on--to the point where each division had its own unique V-8 engines, among other things. That was all changing. You might say that centralization of authority was all the rage in those days: it was a time of consolidations and conglomerate mergers; most large corporations were centralizing authority and decision-making; government at the state and federal levels was rapidly expanding in size and responsibility. In Great Britain, with the government's encouragement, just about the whole British automobile industry was consolidated into one big organization, British Leyland. GM was certainly no exception to the trend, and it had been steadily reducing divisional autonomy and going to a more top-down model as time went on. Even so, as of 1968 it was unprecedented for GM's corporate "mother ship" to originate a car and foist it on one of the divisions. Arguably, this was the first link in the chain of failure that became the Vega. The Chevrolet division staff had been working on its own subcompact design, which it thought was better than the XP-887. Ed Cole rejected it out of hand. Chevrolet was going to put the XP-887 in production as a Chevrolet 'cause he said so, and he was the boss and that's all there was to it! 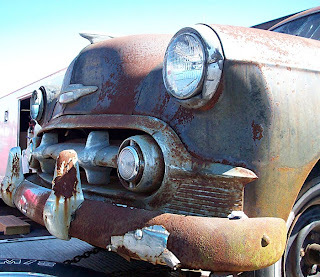 The Chevy people were insulted that their own design had been tossed in the wastebasket, and greatly resented having someone else's pet project crammed down their throats. Did that resentment manifest itself in halfhearted work and sloppy execution? It's hard to say for sure, but as we will see, there were a lot of bad decisions and fumbles along the way. The XP-887 was a typical front-engine, rear-drive design with control arms up front and a live axle with coil springs and trailing arms in the rear. It may seem odd to us today that any car this size wasn't front-wheel drive, but FWD was then uncommon in North America. 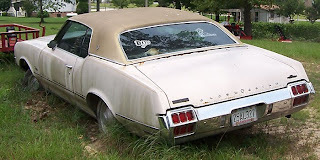 The large-barge Oldsmobile Toronado was the only FWD car in production in North America. The Vega's direct competitors from VW and Datsun and Toyota and Mazda (and Ford and Plymouth and AMC, for that matter) were all RWD, and all but the VW had the engine up front. When the XP-887 project began in 1968, the only FWD subcompact to be found in the U.S. would have been the Mini, which was no longer being actively marketed. Honda began selling the FWD N600 in Hawaii in 1969, and in California the next year. Neither the Mini nor the N600 were anywhere near the forefront of automotive consciousness, and most Americans had never seen either one in the metal--or even knew that they existed. Moreover, FWD in a subcompact would have been uncharacteristically outside-the-box thinking for GM in 1968. GM had had something of a creative period in the late '50s and early '60s, with mixed results. 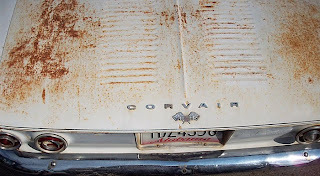 Ed Cole had been heavily involved in the Corvair, a car with a radical rear-engined design which was the most outside-the-box thing GM had ever built. The innovative "rope drive" Tempest, with its rear transaxle, and the FWD Toronado were also developed in the same period. 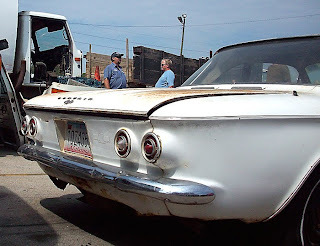 The Corvair's rear-engine layout gave it uncommon handling characteristics that were criticized as unsafe, and it ended up being something of a black eye for GM. The Tempest and Toronado were less controversial in their engineering, but they were expensive to produce relative to what they sold for, so neither really succeeded all that well as a business proposition. While GM had been struggling with only mixed success to make its wilder ideas pay off in the marketplace, its more conventional offerings were earning a better return on investment--and Ford's dead-conventional, non-innovative Falcon, and its Mustang derivative, were like issuing Dearborn a license to print money. This suggested to GM's bean-counters that maybe "radical" wasn't the way to go. That perception combined with the increasing centralization in GM's corporate culture to discourage outside-the-boxness. By using a conventional RWD drivetrain, the Vega could use existing transmissions and differentials, rather than requiring development of a whole new family of FWD transaxles. A completely new engine was being developed for the Vega (more on that in a moment), but the engineers hedged their bets a little by making the engine bay big enough to hold a small block V-8. As a result of all these factors, the Vega's "H-body" platform was dead-conventional Detroit engineering--but it was at least well executed. A Vega had pretty good driving dynamics for something with a live axle rear end. The styling people held up their part of the bargain too. The Vega was a pleasant-looking car with a sporty flair, bearing more than a passing family resemblance to the second-generation Camaro that was being developed at the same time. The Vega's unibody was engineered by GM's Fisher Body division. One of the design objectives was to minimize weight, so the early prototypes used rather thin sheetmetal, and as little of it as possible. Fisher Body deliberately built its prototypes a bit on the light side, on the theory that it's easier to add material to bring a structure up to strength than it is to remove material from something that's overbuilt and overweight. In testing, some of first ones suffered spectacular structural failures, but this was sort of expected. The proper adjustments were made, and the final production design was adequately strong and stiff--the Vega certainly had its problems, but basic structural integrity wasn't one of them. Nevertheless, lurid tales of prototype Vegas collapsing of their own weight or disintergrating on the test track, related in John DeLorean's tell-all book On a Clear Day You Can See General Motors, became part of the legend. The Vega's real weakness was durability. Neil Young once sang that "it's better to burn out than it is to rust." With a Vega, you didn't have to choose one fate or the other--it often suffered both simultaneously. We'll start with the "rust" part. Fisher Body was very enthusiastic about its new "Elpo" process for priming the car's unibody. The entire car body, once assembled, would be submerged in a giant tank full of primer. The body would be given a small positive electrical charge, and the primer in the tank a negative charge, and the resulting electric current would encourage the primer to stick to the metal. This process, or a variation on it, is probably used on every car you see today, and it usually works quite well. What no one noticed as all those Vega bodies were being dunked in the primer tank was that there were void spaces in the unibody, particularly under the front fenders, where air bubbles were getting trapped as the body submerged. Since the metal in these areas never came into contact with the primer solution, it never got primed. Since these spaces were hidden inside the body, nobody noticed it as the car went past on the way to the paint department. The spaces that didn't get properly primed also tended to be moisture traps, and the combination of bare metal and water soon produced rust. In the Vega's case, the rust issue was made worse by executive meddling and penny-pinching in the development process. When John DeLorean became Chevrolet division manager in 1969, the XP-887/Vega was already in the pipeline. He quickly learned that the original production cost and vehicle weight estimates prepared by Ed Cole's XP-887 staff were wildly optimistic, if not completely delusional. The car was going to come out heavier than originally planned, and if it sold at the proposed MSRP, it would lose money. 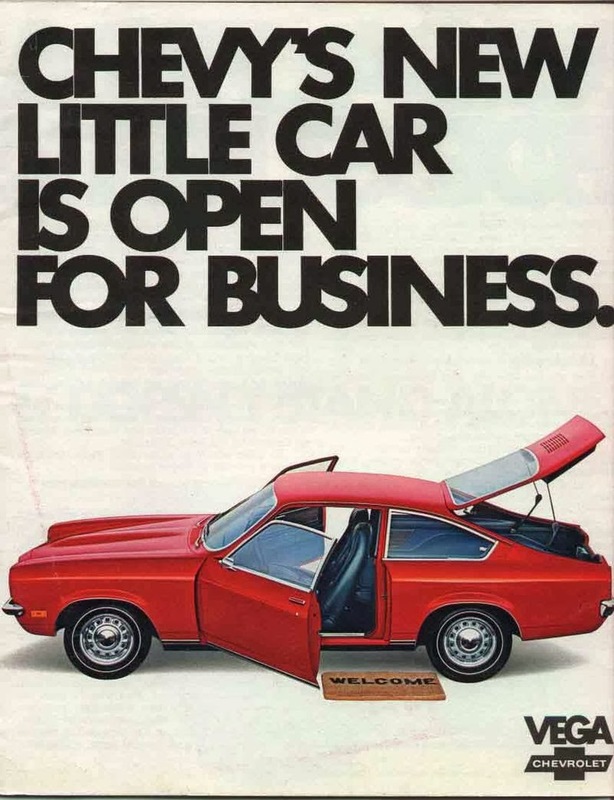 After consulting with his sales and marketing people, DeLorean proposed taking the Vega up-market, giving it a nicer level of trim and selling it as a premium small car with a premium price tag along the lines of the original Nash Rambler. GM's upper management rejected this idea out of hand. The Vega was supposed to be a 2,000-pound car that sold for $2,000 ($10,927 in today's money, or roughly the price of a Hyundai Accent hatchback in base trim with a factory stereo), that's what Ed Cole wanted, and DeLorean and the Chevy staff were just going to have to make that proposition work by making the car cheaper to produce. Some of the cost reduction was accomplished by going to a lower grade of trim (which accounts for the painted steel interior surfaces) and deleting non-critical items like power steering (which it really didn't need anyway), the glove compartment, and the passenger-door courtesy light switch. This saved GM some money without really hurting the functionality of the car, but it also gave the Vega a bit of a low-rent ambience. Other cost-cutting measures had more painful consequences. Someone determined that if the plastic liners in the front wheel wells were left out, it would save $2.88 per car. (Sounds piddly, but a savings of $2.88 each times a few hundred thousand cars equals serious money.) Because there were no fender liners, the front wheels threw dirt and water and road salt up under the fenders--right into the places the primer never got to. The consequence of this was that Vegas were prone to severe rust in the unlined front fenders. The tinworms also feasted on the rocker panels and the bottoms of the doors, where moisture tended to collect inside the body structure. The Vega's rust problems were bad enough, but they pale in comparison to the troubles that lurked in the engine bay. The Vega's 140-cubic inch (2.3L) single overhead cam straight-four engine was designed by GM's corporate engineering staff. To keep its weight down, it used a die-cast aluminum block. Aluminum blocks were nothing new, but this was the most advanced aluminum block yet. Aluminum is a relatively soft metal, so to keep the cylinder bore from wearing out prematurely, aluminum engines traditionally used cast-iron cylinder linings. This made aluminum block engines expensive to build. The new Vega engine was the first aluminum block to be made without cylinder linings. The engine used a new alloy called A-390 that contained fine (0.01 inch) silicon particles to increase hardness. The cylinder bores were treated with an etching process that removed the outer few molecules of aluminum, so that the piston rings were riding on a surface of nearly pure silicon that was hard enough to take the punishment. Aluminum bumpers were a new design feature on the 1974 Chevy Vega. There are linerless aluminum block engines in production today that are made in similar fashion, and they work just fine. The Vega engine did suffer from cylinder scuffing and excessive oil consumption, but it wasn't a failure of the cylinder bore surface itself. No, these problems were a consequence of the cylinder head design. To save money, the GM engineers specified cast iron for the head. The cylinder head actually weighed more than the block it was sitting on. Putting the heavy parts above the lighter parts made the engine top-heavy, and it shook like crazy as the RPMs built up. Today, we'd give it a balance shaft to damp out the second-order vibrations, but balance shafts weren't used in automotive applications back then. 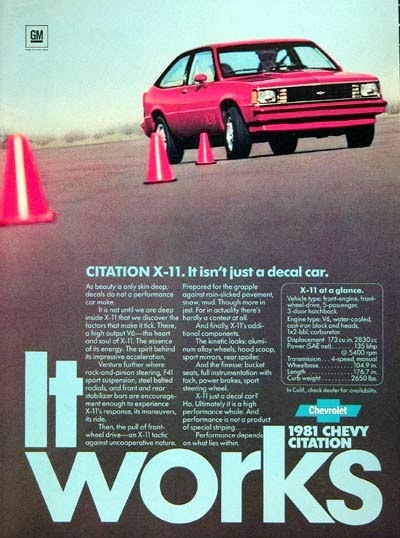 To reduce the vibrations being transmitted through the structure and into the passengers' seats down to a tolerable level, the Chevy engineers gave the Vega very soft engine mounts. This made life more pleasant in the passenger compartment, but did nothing to keep the engine itself from shaking. One effect of all this vibration was that the valve stem seals, which were already more brittle than they should have been, would crack, leaking oil into the cylinders. The engine would start laying down a fine blue haze from the tailpipe, and of course oil consumption would go off the charts. My parents had a Vega hatchback for a while, and we got to experience this first-hand. It reached the point where the car was burning through about a quart of oil with every tank of gas. 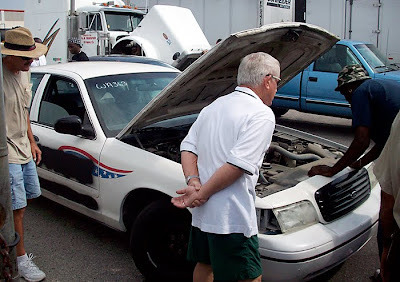 We ended up buying full cases of off-brand el cheapo 10W-30 from K-Mart--it was all going out the tailpipe anyway, so no need to spend more than you had to--and checking the oil level daily, just to keep it running until we could afford a replacement. It's probably fair to say that nearly every Vega with the original version of the 140 engine burned oil after about 20-30,000 miles. If you were lucky, that was the only problem you'd have with the engine. 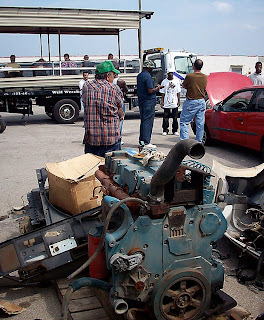 If you were less lucky, the oil leaking into the cylinders contributed to scuffing the cylinder bore surface. But that wasn't the only source of problems in the cylinder bore. In yet another bit of short-sighted, cost-cutting cheapskatery, the size of the Vega's radiator was reduced and the coolant overflow tank was deleted. The final production design cooling system was inadequate, at best. On a hot day, or if the car was being driven hard, it would start losing coolant and overheat. Aluminum blocks will start to warp if they overheat--and if it got bad enough, the cylinder bore would end up with a distorted shape. Having that cast-iron cylinder head making the whole thing top-heavy only made that problem worse. Between the block getting too hot and the engine dancing around like a teenager in a mosh pit and the fact that iron and aluminum expand and contract at different rates, the head gasket also had a rough life. As the head gasket deteriorated, you could get coolant in the cylinders, coolant in the oil, oil in the coolant, more oil in the cylinders, or some combination of the above, none of which are good for the long-term survival of your engine. Unless you were almost obsessive-compulsive about watching the fluid levels, a high-mileage Vega engine could easily run out of coolant and oil at the same time, with little or no warning, and catastrophic results. And the fun didn't stop there. The engine's vibrations also caused the screws holding the Rochester carburetor together to work loose. When they got loose enough, the carb would start coming apart and raw gasoline would flow into the cylinders. Some of that gas ended up pooling in the muffler, where the heat would ignite it, causing backfires and worse. Sometimes the gas would leak in the other direction, dripping down over the outside of the hot engine block and causing a fire. Apparently, GM did not do sufficient long-term durability testing to discover any of these issues--or, having detected them, chose not to do anything about them. That's irresponsible enough, but what's really tragic (in the original Ancient Greek sense of the word "tragedy") is that GM had a better engine design that it chose not to use. The Chevrolet engineers disliked the 140's iron cylinder head and all that came with it, and worked up an alternate, an aluminum crossflow head design called the "L-10." The Chevy crossflow head was lower and lighter, eliminating the top-heaviness and a lot of the vibration, and making it out of the same material as the block solved the differential expansion problem. The L-10 probably would have performed better, and almost certainly would have held up better, than the iron-head 140. Once again, though, the corporate mothership pulled rank and ordered development stopped on the L-10, ostensibly to keep the development costs down. In reality, it was just another manifestation of the top-down mentality that was driving the project. At the end of the development process, the 1971-model Vega that rolled out to the dealerships was everything the buff books said it was: a car with good looks, great handling, and decent fuel economy. 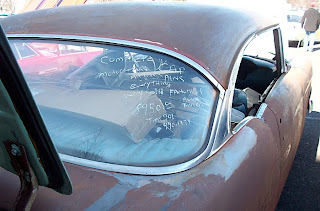 It also had a severely flawed engine and inadequate corrosion protection, and was doomed to burn out its engine and/or rust away sometime between the date the warranty expired and the due date of your last car loan payment. 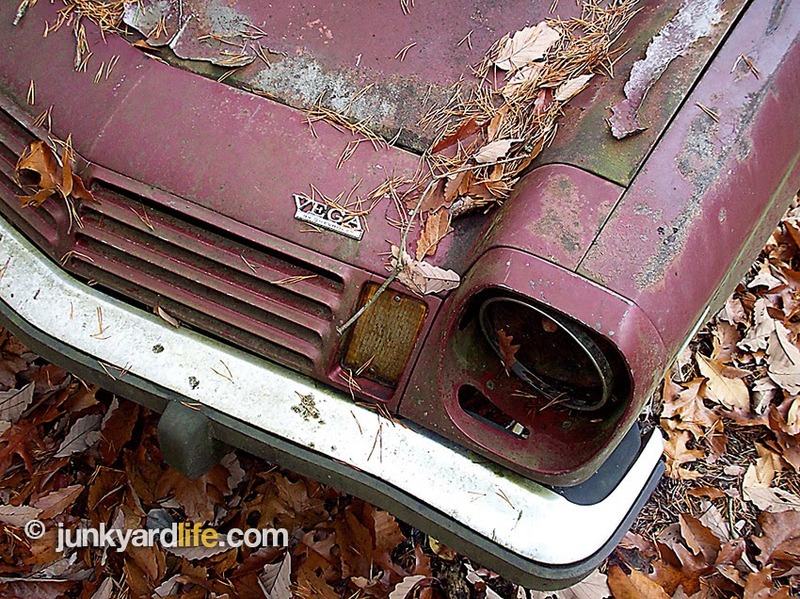 This 1971 Chevy Vega was photographed in the woods in 2008. Gone now. Vega production started in late 1970. The assembly line ran at what was considered a fast pace in those days, around 80 cars an hour at a time when 50-60 seems to have been the norm. Nevertheless the build quality on those first Vegas was good, in part due to a relatively large contingent of quality control inspectors put in place by John DeLorean, and in part because the line was more generously staffed than in other plants that ran at a slower speed. On Oct. 1, 1971, in yet another manifestation of that centralization trend I was talking about earlier, Lordstown was transferred from the control of Chevrolet and Fisher Body to the newly-created General Motors Assembly Division, known by the acronym "GMAD." That acronym is usually pronounced "G-mad." That's appropriate, because, gee, once they got in there, everybody sure got mad! GMAD came in and tried to cut production costs, speeding up the assembly line to 100 cars an hour or more, laying off "excess" people (including most of the quality control department! ), and generally taking a very iron-fisted (and ham-fisted) approach to workplace discipline. Some of the assembly line workers retaliated by sabotaging the cars as they were building them. The conflict climaxed in a 22-day wildcat strike in March of 1972, and though the complaints which led directly to the strike were settled, labor-management tensions at Lordstown remained high for years after. The phrase "Lordstown syndrome" entered the dictionary as a term of art in industrial relations, used to describe a monumental labor-management trainwreck. As you might expect, build quality took a nose dive. Whether through deliberate vandalism or simple indifference, a large proportion of the Vegas built during this time came off the assembly line needing desperately to go straight to the "repair yard." Vegas still sold well--the 1973 oil price shock increased the demand for small cars to the point that GM almost couldn't build them fast enough, even at 100 per hour. 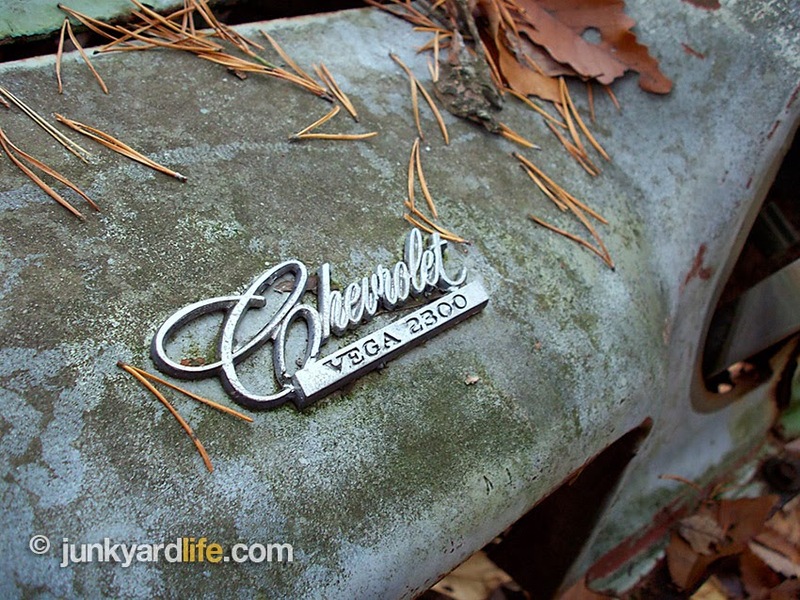 Still, by about the middle of 1973, the Vega's many built-in problems began to assert themselves in ways that were apparent to even the most die-hard Chevy loyalist. 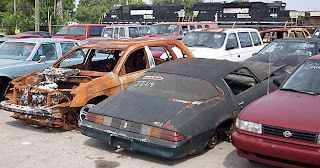 If you walked into a Chevy showroom and took a good close look at the Vega that they wanted to sell you, you might notice that it wasn't all that well put together. The early adopters who lived down the street from you and got one of the first Vegas kept having engine troubles, and some of the other ones you saw around town had pretty bad rust for a two-year old car. Come to think of it, when the strike at Lordstown was going on last year, the UAW was accusing GM of building unsafe cars with defective parts, and GM was saying that the UAW was sabotaging the cars on the line, and there was that recall a while back, something about engine fires, and ... well, at that point you started to think that maybe you really didn't want a new Chevy Vega after all. GM made a belated attempt to correct the Vega's built-in engineering deficiencies. The protective fender liners that had been deleted from the parts list in 1970 were added back in 1974 as a running production change. The lower doors were given enhanced rustproofing, and GM went to galvanized metal for the front fenders. The troublesome engine was redesigned with better valve seals and an improved cooling system, and touted as the "Dura-built 140" with a five-year warranty. It was all too little, too late. Between the strike and the recalls and the rust, the public perception of the Vega was already etched in A-390 aluminum. It was a turkey. A lemon. A turkey marinated in lemon juice. Its aluminum engine had such an awful reputation that when GM introduced its replacement, a pathetic lump of cast iron with pushrod overhead valves that was a throwback to Soviet tractor engines of the 1930s, the TV commercials stressed that it was made of iron, not aluminum. To drive the point home, they even nicknamed it the "Iron Duke," thereby greviously insulting the memory of the original "Iron Duke:" Field Marshal Arthur Wellesley, 1st Duke of Wellington, the victor of the Battle of Waterloo. It's sometimes said that you can learn more from your failures than from your successes. History provides many examples of valuable lessons learned from disasters. The loss of RMS Titanic led to improved ship designs, more effective use of wireless and radio communications at sea, and safety regulations that required enough lifeboats for everyone on a passenger ship. In figuring out why the Tacoma Narrows Bridge collapsed in high winds, civil engineers learned how to design future suspension bridges to better handle wind loads. Analysis of the crashes of early-model de Havilland Comet airliners in 1954 led to a better understanding of metal fatigue and stress fractures--and safer aircraft. It would have been good if GM's executives had learned something similarly valuable from the failure of the Vega and changed its way of doing things, but ... well, no, they didn't. The real cause of the Vega's problems was GM's organizational culture. For a period of decades, General Motors was so successful, and so unassailable, that no one at GM had to worry about its survival. Competitive energy became focused on internal conflicts: GMAD versus UAW, Ed Cole and the "suits" in the head office versus divisional autonomy, muscle-car-era Pontiac versus Chevy, established executives versus younger guys coming up the ladder, and so on and so on. The people who rise to the top in that environment are the ones who excel at winning the organization's internal conflicts. That which advances a particular player's fortunes in the inside game often does not advance the interests of the company as a whole. 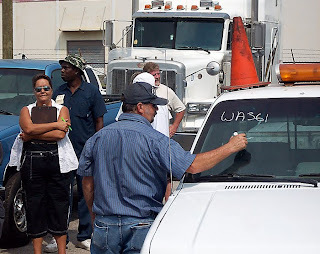 When GMAD and the UAW held dueling press conferences to blame each other for the Vega's deficiencies, each was focused on gaining the upper hand in the wildcat strike--and nobody seems to have been thinking about what this was doing to public confidence in the Vega. Most analyses of the Vega, or GM's woes in general, focus on allocating blame between the participants. Were the Vega's engineering defects Ed Cole's fault because of how he rammed the XP-887 down Chevy's throat, or that of the Chevy engineers who missed so many critical little details? Do we blame the assembly defects on GMAD for running the line too fast, or on the UAW guys for indifference and sabotage? Thing is, when John Q. Carbuyer is standing in the phone booth with his AAA card in hand, calling for a tow truck, he doesn't care about any of that. All he knows or cares about is that he forked over a significant amount of his own hard-earned money (probably taking out a loan for much of it) for this Vega which was supposed to be an innovative, cutting edge car, and it's rusty and it doesn't work right. 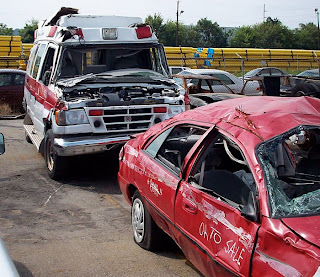 The worst part for GM was that, as bad as it was, the Vega fiasco wasn't life-threatening. Sure, there were millions of dollars in losses from the turmoil at Lordstown and the warranty claims and recalls, but GM could afford it. In 1977, as the last Vega rolled off the line to end this shameful chapter in automotive history, GM was still one of the most powerful industrial corporations on the planet, and it still had around 45% of the U.S. vehicle market. It was easy to just attribute it all to bad luck and ignore the underlying problems. By way of comparison, consider the infamous Dodge Aspen and Plymouth Volaré. They were mediocre cars with atrocious build quality that dissolved into metal oxide with unseemly haste--but under the sheetmetal, the basic drivetrain (the unkillable Slant Six and the well-engineered Torqueflite automatic) and platform engineering were sound. 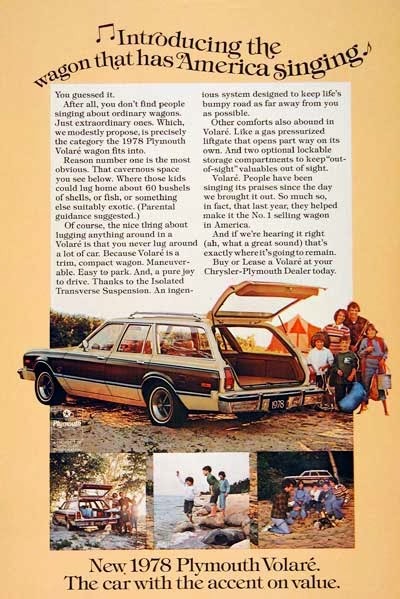 In other words, the worst lemon-scented Aspen or Volaré was a better car than a '71 Vega. Still, because Chrysler was a smaller company with fewer resources, the damage done by the Aspen and Volaré and other product failures in the late 1970s nearly killed it. Chrysler changed dramatically as a result. Not only did GM as an organization not really suffer from the Vega affair, the individuals responsible for it faced no real personal consequences either. Ed Cole, whose "my way or the highway" approach to the Vega's development was a root cause of many of its mechanical deficiencies, was never called on the carpet about it by the Board of Directors. He retired from GM at age 65 in 1974, and headed Checker Motors (the taxicab builder) until his untimely death in a light plane crash three years later. Similarly, the careers of the GMAD executives whose ruthless (mis)management style provoked the confrontation at Lordstown continued uninterrupted. Once things had settled down after the strike, the general manager of GMAD was promoted to Vice President and placed in charge of all assembly operations, and most of the lesser executives and middle managers involved went on to successful careers and comfortable retirement. It was much the same for the unionized workers. One term of the settlement of the 1972 strike was that GM granted what might be called a general amnesty for all those who had been given disciplinary layoffs or terminations, regardless of whether the discipline was deserved or not. Total employment at Lordstown actually increased for several years afterward, so by the time that layoffs started in the late '70s and early '80s, the workers who had been there in 1972 had seniority and were relatively secure. Those who didn't take one of GM's periodic early retirement offers stayed on to get a gold watch and a generous pension at age 65. As I've mentioned here before, I knew quite a lot of people who worked at Lordstown. (In reading one detailed history of the '72 strike, I was struck by how many of the names I recognized.) They were neighbors, the parents and older siblings of my schoolmates, and later, some of the non-college-track kids from my high school. Many were friends of my father, and more than a few volunteered to help him when he ran for office. Five and seven and even ten years later, they still showed traces of "Lordstown syndrome." The vast majority of them were probably good workers--as they were also good neighbors and good friends--but for very understandable reasons they all had at least a wary suspicion of their employer. They showed up, did just what was required of them, and went home, and weren't too particularly worried about how good the end product was. A few--not a majority, not even a particularly large fraction--openly boasted about things like coming to work hung over, sneaking off from the line to take a smoke break, or committing some occasional minor act of vandalism like leaving an empty Coke bottle in the unibody. One thing that always bothered me about these guys was that they were pretty confident they'd never suffer any consequences. If they were caught and suspended or fired, the union would contest it and they'd be back on the job before long. (There's a legal doctrine called "duty of fair representation" that basically requires a union to defend its members in every such situation, even when the discipline is richly deserved.) There weren't a lot of people like that at Lordstown, but it didn't take many. I'm not writing this to put these people or my old hometown down by any means, but to make a larger point. Building a car on an assembly line is a cooperative effort requiring several hundred people; if just a few of them line up the pieces wrong or forget to put all the screws in, or just one or two damage the car as it goes by, it rolls off the end of the line with assembly defects--even though everyone else on the line did their jobs right. 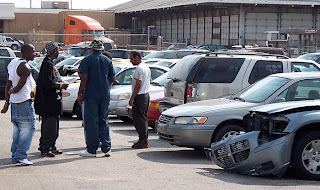 The consequences of putting defective vehicles on the market are severe to the organization as a whole, but because they're not immediate, and don't fall directly on the responsible individuals (labor and management), there's little incentive to change. Since nothing changed, the "Vega syndrome" soon repeated itself. 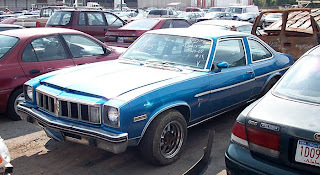 The Oldsmobile 350 diesel V-8 introduced in 1978 was an innovative, game-changing approach to getting better fuel economy out of a traditional full-sized car. Much like the Vega, it was a good idea spoiled by inattention to engineering detail. As with the Vega, GM eventually corrected all the engine's problems, but only after the public had lost confidence in it. And then it happened again. For the 1980 model year, GM introduced a quartet of innovative, game-changing, world-beating front wheel drive X-platform cars, the Citation, Skylark, Omega, and Phoenix. Like the Vega, they made a great first impression on the buff books and the early adopters. Also like the Vega, they suffered from numerous engineering deficiencies which should have been solved before the car went on the market. Like the Vega, they had uneven build quality (even in the absence of bitter labor-management conflict) and were subject to recalls. As with the Vega, the public lost confidence in the cars just as GM was belatedly working the bugs out of them. 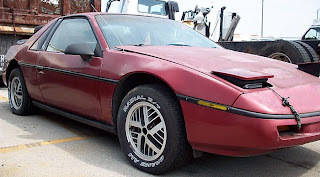 And then came the Fiero, a mid-engine sports car with innovative construction (composite panels over a steel spaceframe) that promised to completely remake the performance car market. While not as much a victim of engineering malpractice as the Vega or Citation, the first Fieros were underpowered (by the horrid Iron Duke) and overweight and prone to engine fires. GM eventually worked the bugs out, just in time for sales to dry up as the customers stayed away in droves. I could keep going, but I think you get the point. Every time this sort of thing happened, it was a compelling argument to John Q. Carbuyer that his next set of wheels should come from somewhere other than General Motors, but GM's response was more of the same. "...the competitive knives Saturn faced within GM did far more damage than any threat from overseas: execs who felt the auto giant already had too many brands and factories; dealers resentful of Saturn's product-development dollars; and a labor union whose leadership came to regard the brand's workplace innovations as collaborations with the enemy." Saturn, of course, eventually became a brand made up largely of rebadged Opels and was ultimately killed last fall when GM was in a desperate state that would have been unthinkable when the Vega was conceived. 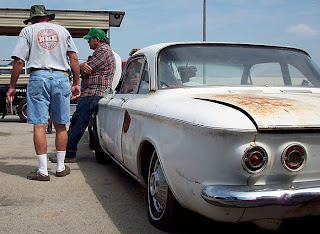 "... they are only a roll cage, tub job, and power plant transplant away from being killer drag racers. There is something special about seeing a Monza Wagon wheelie the length of a quarter mile ..."
If you're not quite into drag racing, you can still turn an H-body into a wicked little sleeper or summer cruise-in special. Find one that isn't too badly rusted and take a little time to correct the build quality issues. Toss out the 140 (or, if it's a Monza, the hapless Iron Duke or the hopeless V-6) and take advantage of the generously sized engine bay to put in a modern turbo six or a small block V-8. Story above originally published on carlustblog.com on Dec. 2010 with photographs from Jody Potter’s 2008 story, "Chevy Vegas Hiding in the Woods"
See my original Vega story republished here on Junkyard Life. A 1972 Cutlass Supreme sounds like a bargain at $250. My friend spotted the car at the end of a dead end dirt road in Cullman County, Alabama. ‘It looks like a decent project car,’ he said. He sent me on my way with this threat. ‘If you don’t buy it, I will.’ My task was at hand. A possible classic project car for chump change. Was it too good to be true? Driving alone for 50 miles to see a car on a hot August day in Alabama is no fun. So I took my dad along for a sweltering ride in my latest ‘box’ Caprice. Vintage 1986 General Motors. Uninsured driver essentials such as random body dents, sagging springs, a droopy headliner and nonfuntioning A/C were along for our trip. Twenty-plus years of decay and neglect rolling on shiny wire wheel covers. Making matters worse, the foam headliner backing material was crumbling and blowing into our eyes with the windows down. We lowered the windows just enough to prevent suffocation from the stiffling heat eminating from the Caprice’s ‘air’ vents. Sweat ran down my shins. The pea green velour seat, our couch-like sponge. I mentioned to my dad that our long, hot trip to a dead end dirt road was wearing on my enthusiasm. 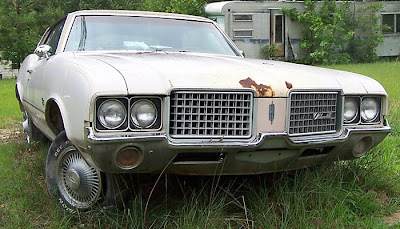 The Cutlass was dutifully planted behind a house at the end of a dead end road. An overgrown single-wide trailer also graced the backyard. The owner paused from picking vegetables long enough to tell us her Cutlass was parked due to transmission issues. Decals decorating the back window glass told more of the Oldmobile’s story. ‘B!tch from hell’ and ‘Calvin’ peeing on the word ‘ex-husbands’ stickers were proudly displayed. Rust holes oozed beneath the rear window and splattered sunlight into the trunk. Moisture trapped by the tan vinyl top had caused the only damage to the otherwise flawless creme-colored body. Its brown interior contained the junkyard smells of mold, assorted papers and discarded memories. 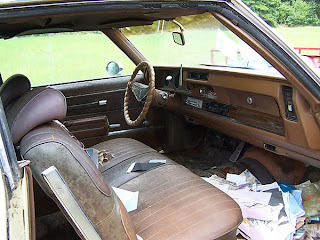 The driver’s seat bore the brunt of years of wear but otherwise the Olds’ upholstery could be cleaned up. Raising the hood to look at the Olds 350-cubic-inch engine proved to be a difficult task. Pulling the latch and gently rocking the hood side-to-side a dozen times freed the stagnant hinges. I didn’t expect the swarm of wasps I laid eyes on when I lifted the hood. My dad had already backpedaled, years of junkyarding taught him to beware. I jumped away and we waited for the swarm to calm. A quick glimpse of the dirt-glazed engine bay revealed the original 350-V8 engine and 2-barrel carburetor. I didn’t buy it. I should have. Looking through these pictures is painful. I missed out on a deal. 1972 and older models are like money in the bank, even if they are projects. Its always a good idea to make photos when you check out a car for sale. I should have looked at the photos the day after our trip. My decision would be different today. With a bit of research I would have known that the fenders go for $200 each. 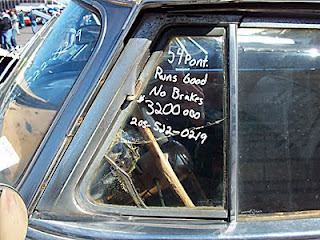 Selling a few parts would have covered the cost of the car if I had gotten into a financial bind. I would also have been the proud owner of an Oldsmobile, another GM make that has ceased production. The car is gone. My buddy, Michael, drove to the dead end road for another look. 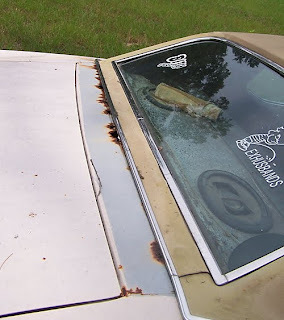 The dead spot in the grass was all that remained of the 1972 Cutlass. The owner likely scrapped it out for a few hundred bucks. Without a buying plan, I turned tail without a Cutlass. Maybe I was crazy from the heat? No, I just failed to see the potential of the car. 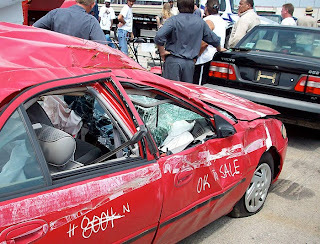 Will cost of vehicle and repair costs total exceed market value of vehicle? Most of all — is it a vehicle you love enough to live with on your lawn? Asking price too high? Make an offer before you walk. 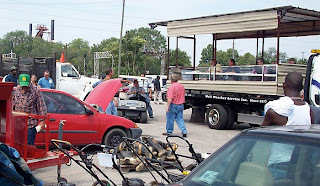 Buy a car trailer if you plan on buying and selling vehicles frequently. Factor in the cost of a towing if you don’t have access to a trailer. VIN # fodder see this link. First digit is a 3, its covered in photo.